In an earlier article, we talked about the importance of optimizing memory data structures for speeding up our simulation codes. In that article we considered only the memory structure needed to hold field data such as potential or density. However, particle methods (such as ES-PIC), need more than just an efficient field solver. Quite often, it is not the field solver that dominates the computational effort – it is the particle push. As an example, when simulating space plasma thruster plumes, we can often get away with assuming quasi-neutrality and obtaining potential directly by Boltzmann inversion, \(\phi = \phi_0 + kT_e\ln(n_i/n_0)\) instead of solving the non-linear Poisson equation. In that case, the field solve becomes a trivial operation scaling with the number of nodes. But on average, we may have some 20 or even hundred particles per cell. Then, the particle push may scale as \(\sim50n\). Add in the particle-surface handling, collisions, chemical reactions, and so on, and the computational fraction associated with moving the particles goes through the roof. What makes particle storage fundamentally different from the mesh is that typically at the start of the simulation we have no idea how large the particle array needs to be. As an example, consider the simulation used to load an isotropic velocity. We start with an empty domain and inject particles from a point. The particles expand radially until they cross outside the computational domain. They are then removed from the simulation. The particle count will continue to grow until the number of particles created equals the number of particles lost through the boundaries. 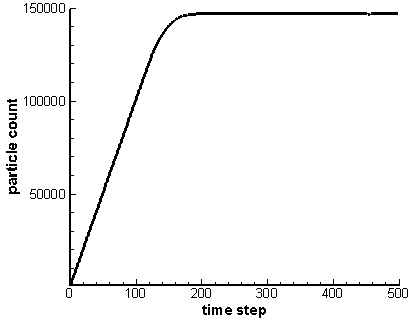 This is illustrated below in Figure 1, which comes from running the example program for 500 time steps. Since we do not know how many particles there will be at this steady state, we need a particle structure that can easily and efficiently grow to accommodate new particles. Figure 1. Particle count versus simulation time step. The steady state is reached around time step 175. So let’s consider few alternatives. The first option is to use a single memory block. Here we allocate a particle array large enough to hold some initial estimated particle count. 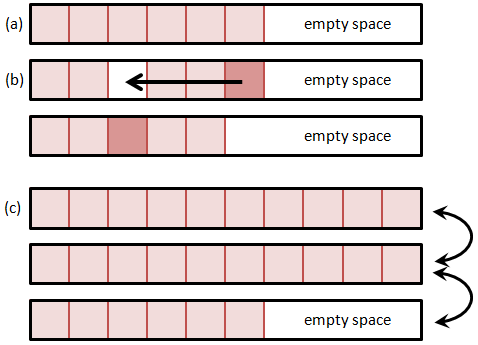 Whenever we need more space, we realloc the memory structure to expand it. But how do we add and remove particles? Removing any but the last particle will leave a hole in the list. We can leave this hole empty, and fill it the next time when adding a new particle. However, this approach is highly inefficient. Unless we create another data structure to hold the positions of all the holes, adding a particle will require us to loop through the entire list until we find an empty slot. The time required to add a particle thus directly depends on the number of particles, which is not something we desire. A somewhat better alternative is to shift the list forward to close the hole. Although we can now utilize memory copy operations, this approach will again get slower as the list size grows. Figure 2. A single memory block data structure without hole removal. A particle is removed in (b). Two particles are then added in (c). Even more prticles are added in (d), requiring the block to grow. The above method used to be quite common and still is in legacy (Fortran) codes. But it has one significant disadvantage, especially when deployed on modern multitasking computers. As the particle count grows so does the requirement for a single large contiguous memory block. It may not be possible to get a block large enough even if the computer is reporting sufficient total RAM, due to memory fragmentation. As such, it is better to distribute the particle list to a number of blocks, each holding up to some prescribed number (such as 10,000) particles. Adding a particle requires looping over the blocks to find the first block with an empty space. The particle add is now no longer a fixed-time operation, but scales with the number of particle blocks. But since the number of blocks is relatively small (100 for one million particles and 10,000 particles per block), this overhead is also relatively small and can be further reduced by increasing the block size. This method is illustrated below in Figure 3. Figure 3. Particle block data structure with an instant hole removal. Particle is removed in (b) and the hole is immediately filled with the last particle from the block. Adding more particles results in the creation of new linked-listed block in (c). Figure 4. Linked-list particle data structure. The particles are scattered through the memory but each particle is connected to the next and the previous neighbor. 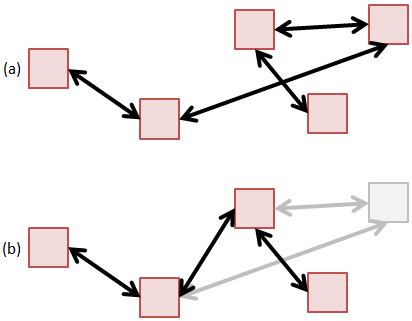 Removal of a particle in (b), shown in gray, results in breaking and rejoining of the links. The issue with linked lists in general is that they are inefficient from the cache perspective. This was shown in the previous article on memory access. However, since a typical particle push operation requires access to a wide range of data structures, it is quite difficult to make the particle push cache friendly without going to great lengths in optimizing the rest of the code. As such, the fact that a linked list is not cache friendly gets lost when considering the bigger picture of gathering field variables or checking for surface impacts. All these operations will in general destroy the cache. You can download the entire source code here: ParticleSpeedTest.java. By the way, these are just few of the many possible ways of storing particles. Furthermore, a linked list may not be fastest in your particular implementation. That’s why it’s important to do the profiling studies. I would be interested in hearing from you. What method do you use in your programs? Which have you found to be the fastest?